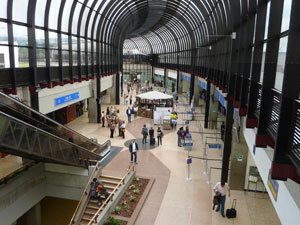 Jose Maria Cordova airport is the principal airport which serves the city of Medellin. Despite its slightly tired look it is a fairly well-organised airport. Both national and international flights leave from the airport's one and only terminal. All of Colombia's airlines have flights from Jose Maria Cordova airport with the exception of Satena who fly solely from the smaller Olaya Herrera airport in the city of Medellin. Various airlines run international flights including American Airlines, TACA, Copa, and LAN, as well as Colombian carrier Avianca. Be warned that queues for international flights can be incredibly long, both at check-in and going through customs so arrive well in advance of your flight time. If flying to / through the USA you can sometimes incure even more delays due to additional searches required by US Homeland Security. Jose Maria Cordova airport is large enough to include all the usual facilities expected of an international airport including restaurants and ATMs accepting VISA and Mastercard. You have various options to get from Jose Maria Cordova airport down to the city of Medellin all of which take about an hour. A taxi will cost around 60,000 pesos (the exact price will be on an official price list usually stuck to the front windscreen of the taxi. Note that the official price will get you as far as San Diego (at the bottom of Las Palmas avenue). Some drivers will continue to your destination for no extra fee, provided it is relatively near. Others will charge you an additional fee. You can also take a shared taxi known as a "taxi colectivo". The three or four passengers split the fare between them which usually equates to around 15,000 pesos each. There are also official Medellin airport buses which charge about 8,000 pesos. The buses usually run until around 8 or 9pm so if you're arriving on a late-night flight you may be forced to take a taxi. The buses drop you either at San Diego or in the city centre, near the Hotel Nutibara. If you wish to take a taxi it's best to phone specifically for one. Some taxi drivers will be prepared to take you to the airport if hailed on the street, but others won't. The fare is around 60,000 pesos. Shared taxis (taxi colectivos) leave from the city centre near Los Torres de Bombona. Ask anyone nearby and they'll indicate the small side street from where the taxis leave. Don't turn up there short of time and expecting to leave immediately as you have to wait until the taxi is full. I once waited for well over half an hour! Official Medellin airport buses leave from near the Hotel Nutibara in the city centre. The trip costs 7,000 pesos and takes about an hour depending on traffic.